This is the one to get if you love Heaney: it spans 30 years of his work and includes his Nobel Lecture as well as sequences from The Cure at Troy and Sweeney Astray. Also the one to get if you don't love Heaney: because you will. His poetry stings and lingers like peat smoke; it speaks to the marrow of your bones. As selected by the author, Opened Ground includes the essential work from Heaney's twelve previous books of poetry, as well as new sequences drawn from two of his landmark translations, The Cure at Troy and Sweeney Astray, and several previously uncollected poems. Heaney's voice is like no other--"by turns mythological and journalistic, rural and sophisticated, reminiscent and impatient, stern and yielding, curt and expansive" (Helen Vendler, The New Yorker)--and this is a one-volume testament to the musicality and precision of that voice. The book closes with Heaney's Nobel Lecture: "Crediting Poetry." Seamus Heaney (1939-2013) received the Nobel Prize in Literature in 1995. His poems, plays, translations, and essays include Opened Ground, Electric Light, Beowulf, The Spirit Level, District and Circle, and Finders Keepers. 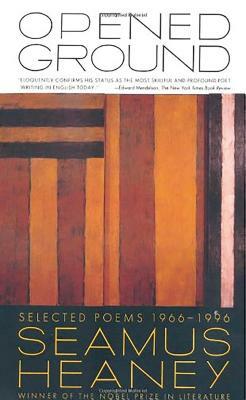 Robert Lowell praised Heaney as the "most important Irish poet since Yeats."